The island of Kauai is one of the greenest and lushest in the state of Hawaii, popular among outdoor enthusiasts and people looking for remote and picture-perfect tropical beaches. Most people who visit Kauai stay either in the Poipu, Lihue or Kapaa areas. Kauai attractions range from an amazing array of natural sights like waterfalls, rainforests, rivers, white-sand beaches, steep sea cliffs, hidden caves and even a canyon, to man-made attractions such as museums and temples. Kauai sightseeing never gets boring, especially if you enjoy hiking and exploring tropical surroundings and nature. 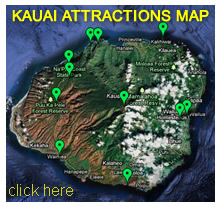 Below is a list of some of the best things to do on Kauai.